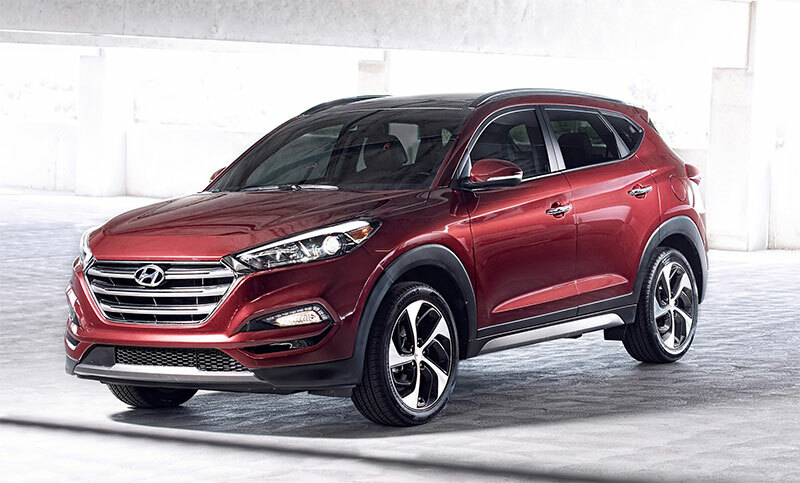 Hyundai today unveiled its all-new Tucson crossover utility vehicle at the New York International Auto Show. The new Tucson offers a fresh, sporty exterior and appealing interior design while making overall fuel efficiency a top priority, with significantly enhanced fuel economy ratings over the previous model. Further, the new Tucson, when equipped with Automatic Emergency Braking, is expected to receive a Top Safety Pick+ from the Insurance Institute for Highway Safety (IIHS). For 2016, advanced safety technologies such as Automatic Emergency Braking with pedestrian detection, Lane Departure Warning System, Blind Spot Detection, Rear Cross-traffic Alert, Lane Change Assist, Backup Warning Sensors and standard rearview camera also will be offered. The new Tucson will arrive at Hyundai dealers in July. The 2016 Tucson design employs sculpted body forms and sporty contours for an athletic, bold and striking appearance. The front view proudly presents a hexagonal-shaped grille, a key element of Hyundai’s design signature, enhanced by available high-efficiency LED twin-projector headlights, LED headlight accents and integrated LED Daytime Running Lights (DRLs). The wheelbase has been increased by more than an inch, for enhanced design proportions, interior flexibility and a smoother ride. For the first time, 19-inch alloy wheels will be offered, with a dynamic asymmetrical spoke design, surrounded by forward-raking wheel arch design. Even the door handles feature convenient approach LED lamps. The new Tucson’s roof rails are sleek and low-profile, for an integrated, functional appearance. From the rear, a Z-shaped character line above the rear wheels accentuates an aggressive, sporty side profile. The rear view conveys stability and a wide, sporty stance, for agility both on and off-road. 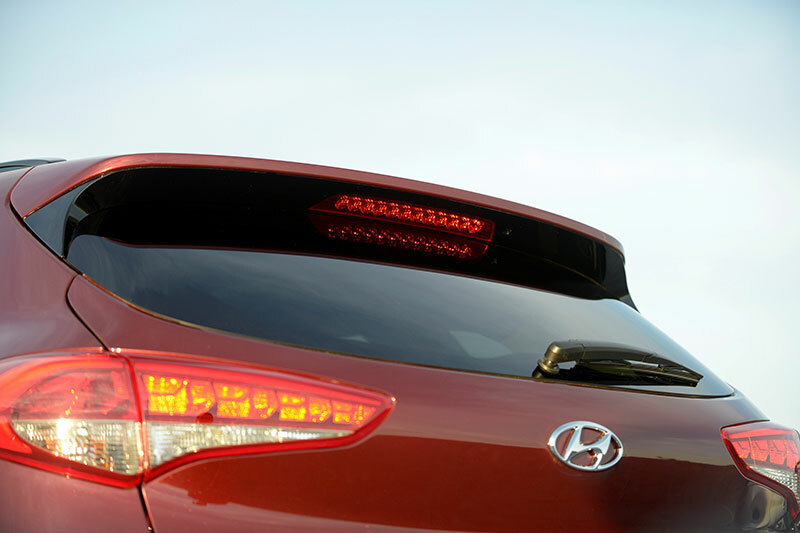 The taillights also utilize LED technology, creating a premium design element while providing enhanced visibility from the rear. Finally, twin, bevel-cut chrome exhaust tips and a standard rear spoiler add even more sporty cues from the rear view. On the inside, a premium, wrapped instrument panel with will be offered, with extra-wide instrument panel contours to enhance occupants’ overall sense of interior roominess. A stitched, premium, soft-touch pad is located near the driver’s right knee, for better comfort during long commutes or spirited cornering. Interior touch points have been upgraded with premium, soft-touch materials. All interior switchgear has a more refined feel during operation. The overall ambience of roominess is further enhanced by an available full-length panoramic sunroof, allowing both front and rear passengers day or night skyward visibility. The 2016 Tucson is longer, wider and has a longer wheelbase than the previous model for greater interior volume and versatility. Overall, cargo room has been increased to 31.0 cubic feet, a full five cubic feet over the previous model, with a dual-level rear cargo floor further enhancing cargo-carrying versatility. The rear liftgate opening has been enlarged in every dimension, for greater cargo flexibility. The 60/40 rear seatbacks have a greater range of adjustable recline for varying combinations of passengers and cargo, with an increased available recline of 37 degrees compared with 28 degrees for the previous model. 2016 Tucson powertrain offerings also have been improved with top efficiency levels as a primary target. Base models offer a Nu engine family, 2.0-liter, direct-injected four-cylinder with an estimated 164 horsepower and 151 lb.-ft. of torque, coupled with a 6-speed automatic transmission. The six-speed automatic offers SHIFTRONIC™ manual shifting mode and includes an overdrive lock-up torque converter for higher fuel economy at highway speeds. Based on internal tests, fuel economy for the 2.0L FWD model is estimated at 23 (city), 31 (highway), 26 (combined). The 26-mpg combined fuel economy rating is a one-mpg improvement over the previous model. Further, powertrain NVH has been reduced through hydraulic transmission mounting and recalibrated engine mounts. Eco, Sport and Limited models offer a new, Gamma engine family, 1.6-liter turbocharged, direct-injected four-cylinder with an estimated 175 horsepower and 195 lb.-ft. of torque. Peak torque delivery starts at only 1,500 rpm and holds through 4,500 rpm, for low-RPM responsiveness and performance in everyday driving conditions. The turbocharger features low-inertia turbo-spooling response characteristics, and an electronic wastegate control for more precise control of manifold pressure. Internally, piston-cooling oil jets ensure cooler piston temperatures for enhanced engine life. Further, the Gamma engine features a new water jacket insert that automatically prioritizes cooling in the upper level of the cylinder block, where more combustion heat is generated, resulting in lower cylinder head temperatures and allowing for leaner air/fuel mixtures for better fuel efficiency. The turbo engine is coupled to a new, first-in-segment seven-speed EcoShift® dual-clutch transmission (DCT). This dual-clutch transmission offers outstanding efficiency with quick, seamless shifting and brisk acceleration. When compared with some competitors’ continuously-variable transmissions, this DCT is able to handle more torque with minimal power interruption throughout the powertrain operating range and with greater durability characteristics. Based on internal tests, estimated fuel economy for this powertrain on Eco FWD models is 26 (city), 33 (highway), 29 (combined), a 5-mpg improvement over the former Tucson 2.4L engine. Sport and Limited FWD turbo engine models are estimated at 25 (city), 30 (highway), 27 (combined), representing a 3-mpg improvement in combined fuel economy over the former Tucson 2.4L engine. In addition, the new Tucson’s fuel tank has been increased by 1.1 gallons for even greater driving range. 2016 Tucson will offer an advanced AWD system developed by Hyundai in conjunction with Magna Powertrain. The system includes a driver-selectable AWD lock that allows a differentiated torque split between front and rear wheels, for off-road and extremely slippery road conditions. The system also includes Active Cornering Control, which automatically transfers torque to the wheels with the most traction. The system reduces understeer and enhances cornering performance by braking the inside rear wheel and delivering more torque to the outside rear wheel, providing a torque-vectoring effect. Finally, the system incorporates both Hillstart Assist and Downhill Brake Control to assist drivers facing sharp incline or decline conditions. The 2016 Tucson platform offers enhanced driving dynamics with more than one inch increase in width and a 1.2 inch increase in wheelbase for greater ride comfort and linear stability. The front and rear overhangs were increased in smaller proportion to this increased wheelbase, centering more of the Tucson’s mass within the wheelbase for better handling response and control. Even more, the entire Tucson chassis is more rigid, now using more than 50 percent Advanced High Strength steel compared with 18 percent for the former model. The new Tucson also benefits from strategic use of structural adhesives at higher stress points on the chassis and more extensive use of hot-stamping methods for greater rigidity. The structure also uses four-point bushing mounts for improved comfort and reduced road noise. A world’s first shock-absorber mounting structure, the 2016 Tucson employs a dual-reinforcing panel rear wheelhouse design, which optimizes panels that are prone to vibration, resulting in a 109 percent increase in rigidity, reduced road noise levels and ride and handling improvements. The Tucson suspension has been enhanced for more precise handling without sacrificing ride comfort. The front suspension is a MacPherson strut design, with coil springs, gas-filled shock absorbers and a 24.7 mm stabilizer bar. The rear suspension is an independent, multi-link design, now with dual lower arms for both FWD and AWD, for optimal ride comfort and body control. Both front and rear suspensions use SACHS® dampers and lightweight, hollow stabilizer bars for superior body control in all driving conditions. Rear suspension control arms have been lengthened to minimize camber and toe changes throughout the suspension travel range, which has been increased to better absorb larger impacts. In addition, the jounce bumpers now use a more sophisticated, hydraulic-type design, for more refined responses over larger road impacts. Suspension bushings are now composed of a higher-dampening synthetic rubber for smoother ride characteristics when compared with conventional rubber. 2016 Tucson also offers Drive Mode Select, which allows the driver to customize their Tucson’s dynamic responses, such as steering feel, transmission and overall powertrain responsiveness to their preferences, and to changing road or traffic conditions. Tucson’s lower coefficient of drag was achieved through a special aerodynamic design focus on the A-pillar design, rear spoiler side garnish design and underbody panels, all of which reduce air vortex and resulting aerodynamic drag. In addition, steering feel has been enhanced with an improved motor-driven power steering system and extensive use of lightweight, rigid aluminum for the rack assembly, for greater precision and feedback. Overall friction for the steering system has been reduced by more than 20 percent compared to the previous model. The Tucson’s motor-driven power steering is more efficient and quieter than traditional hydraulic systems by reducing parasitic losses from ancillary belts and their continual drag on the powertrain. Further, the steering system has been upgraded for more precise and rapid adjustments in steering feel with changing driving conditions. The steering wheel itself now offers a wider range of tilt and telescopic adjustment for greater driver comfort. The 2016 Tucson offers several compact CUV segment firsts, including ventilated front seats and YES Essentials® stain-resistant seats. Newly available features on Tucson include LED headlights and accents, LED Daytime Running Lights, HID headlights with Dynamic Bending Light (DBL) that turn-in with the direction of the steering wheel, LED map lights, color LCD cluster display, individual tire monitoring, power passenger seat and heated rear seats. The new Tucson also offers a smart power liftgate with auto-open. The smart power liftgate enables the Tucson owner to automatically open the rear liftgate, hands-free, by simply standing within a few feet of the liftgate for a few seconds with the key fob in a pocket or purse. This is especially convenient whenever the owner may be holding shopping bags or other items and needs hands-free access to the cargo area. The new Tucson will offer a standard five-inch color LCD display with rearview camera and touchscreen function for intuitive operation. Apple Siri® “Eyes Free” integration also is now available. On the navigation-equipped Tucson, popular apps such as Pandora® Internet Radio and Yelp® are already integrated with the multimedia system. The Yelp® app has been optimized for Tucson’s eight-inch touchscreen and will help find restaurants, shopping and more. Selected restaurants will also offer reviews, ratings, hours and pricing. Once a restaurant is chosen, the navigation system can provide directions to the restaurant without even requiring passengers to input the address. For audiophiles, Tucson also offers an available 405-watt, AM/FM/SiriusXM premium audio system with eight speakers. The latest generation of SiriusXM Travel Link® with Traffic, Sports, Weather, Stocks, Fuel Prices and Movies is also available. SiriusXM’s Tune Start® allows the replay of a song from its beginning whenever a preset is selected. Additional multi-cultural channels are also available. 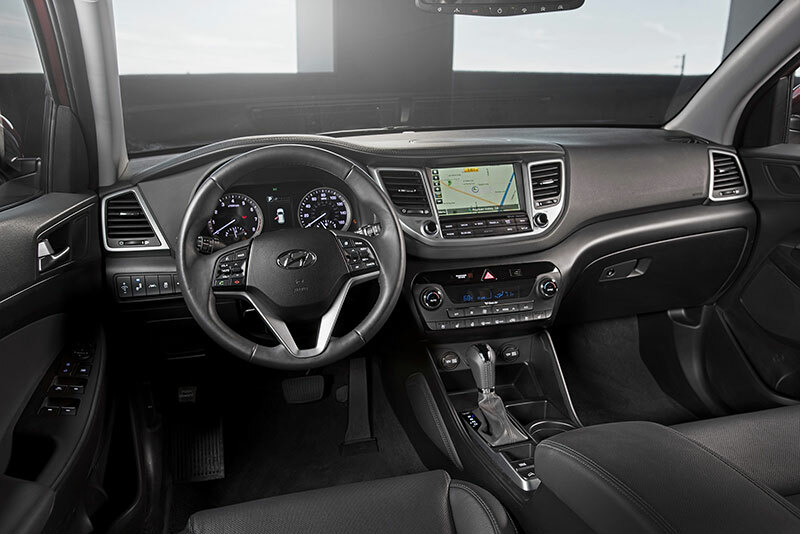 Tucson will also offer Hyundai’s next-generation navigation system, with an advanced, eight-inch display for easy legibility. Display brightness increased by 33 percent over the former system for enhanced daytime visibility. This system’s improved touchscreen sensitivity makes it even easier to touch and drag for system inputs. The screen also now offers a split-screen display with both map and music data available simultaneously. The 2016 Tucson is expected to receive a Top Safety Pick+ rating from the Insurance Institute for Highway Safety (IIHS) when equipped with Automatic Emergency Braking. For 2016, new, advanced safety technologies such as Automatic Emergency Braking with pedestrian detection, Lane Departure Warning System, Blind Spot Detection, Rear Cross-traffic Alert, Lane Change Assist, Backup Warning Sensors and standard rearview camera are offered. In addition, advanced high-strength steel represents over 50 percent of the new Tucson’s structure, for enhanced crash safety. The Tucson is engineered to provide its passengers with multiple defensive safety layers. The A-pillar and mirror blind spots were reduced for enhanced driver visibility. The steel unibody has integrated crumple zones and a high-tensile front sub-frame designed to work together to reduce the forces that typically reach the passenger compartment. The center pillars serve as the anchors of a ring structure which improves overall side structure stiffness while also creating more room for the door armrest and seat. All four doors also have internal guard beams to protect passengers in a side-impact collision. The entire body shell has been made stiffer and lighter thanks to extensive use of advanced high-strength steel, and the use of Tailor Welded Blanks (TWB) reinforces key structural members. TWB assemblies combine steels of different thickness and grades using a sophisticated laser welding and stamping process to achieve an optimal stiffness-to-weight ratio. TWBs reduce body weight while enhancing crash energy management. Tucson also features a standard Tire Pressure Monitoring System (TPMS) that alerts drivers if one or more tires are under-inflated, including the tire’s location. The new Tucson offers eight appealing exterior colors and three interior color environments. Six of these exterior colors are all-new, including Chromium Silver, Coliseum Gray, Ruby Wine, Mojave Sand, Sedona Sunset and Caribbean Blue. Winter White and Ash Black fill out the diverse eight-color offering. Interior color environments include black, beige and gray in cloth, and black or beige in leather, available on Limited models. The 2016 Tucson offers the next-generation of Hyundai Blue Link®, with enhanced safety, service and infotainment telematics. Blue Link brings seamless connectivity directly into the car with technology like remote start/stop, destination search powered by Google®, remote door lock/unlock, car finder, call roadside assistance, remote climate control and stolen vehicle recovery. Many of these features can even be controlled via the latest Android Wear ™ smartwatch offerings. In addition to these features and services, Tucson models equipped with Blue Link come standard with one year of complimentary Blue Link® Connected Care. Connected Care is a suite of safety and car care features providing Hyundai owners with free proactive services including automatic collision notification, SOS emergency assistance, enhanced roadside assistance, monthly vehicle health reporting and maintenance alerts. Blue Link is offered in three service packages: Connected Care, Remote and Guidance.